Much has been written on a great human being named Avul Pakir Jainulabdeen Abdul Kalam. He was much loved by the world not only as a brilliant scientist but as a diligent strategist. I still remember when Dr. A P.J. 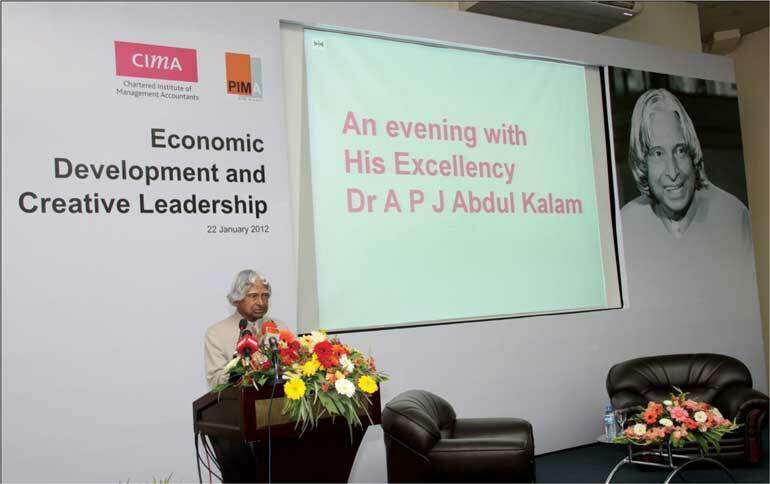 Abdul Kalam visited the Postgraduate Institute of Management (PIM) on 22 January 2012. Today’s column is all about reflections on what he shared with us at PIM. 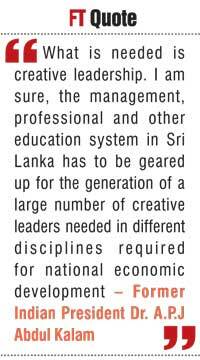 Dr. Kalam visited Sri Lanka for the first time in January 2012. As a ‘People’s President’, he received a rousing welcome. Among the many activities on his agenda, he delivered a speech on ‘Ignited Minds of Youth is a Great Resource for a Nation’ at the Bandaranaike Centre for International Studies. He visited Jaffna University as well. What was so special to us was that the alumni of the Postgraduate Institute of Management (PIMA) and the Chartered Institute of Management Accountants (CIMA) had jointly organised an evening lecture at PIM on ‘Economic Development and Creative Leadership’. A world of nations where there is equitable distribution and adequate access to energy and quality water. A world where the core competencies of each nation are identified. Missions synergising the core competencies of different nations lead to economic advantage and faster development for all the societies. A world of nations where all the students of all societies are imparted education with a value system. A world of nations where affordable quality healthcare is available to all. A world of nations where governance is responsive, transparent and corruption-free. A world of nations where crimes against women and children are absent and none in society feel alienated. A world that is prosperous, healthy, secure, devoid of terrorism, peaceful and happy and continues along a sustainable growth path. A world of nations with creative leadership which ensures effective mechanisms to resolve conflicts between nations and societies in a timely manner, keeping overall peace and prosperity of the world as a goal. According to Dr. Kalam, the realisation of this vision will require, above all, creative leaders with the qualities of nobility, compassion, innovation, transparency and benevolence. He also mentioned that this world Vision 2030 has been derived out of the Distinctive Profile of India by 2020. “Since you are all from the management and business community of Sri Lanka, let me explain, what sort of business opportunities are awaiting in India, so that India and Sri Lanka can work together to improve their bilateral relationship,” said Dr. Kalam. (5) Self-reliance in critical technologies. These five areas are closely inter-related and progressing in a coordinated way, leading to food, economic and national security. “The world in the 21st Century will be a knowledge-based society with multiple opportunities,” said Dr. Kalam. He was referring to a book ‘Empires of the Mind’ by Denis Waitley. This book gives what type of the new world which we are facing now? What was yesterday and what is today. Institutions will be powerhouses for knowledge. 10.Yesterday - profits were earned through expediency: Today – Work with integrity and succeed with integrity. Home, organisations and educational places should become learning places. “I am sure, all the members present here will keep these aspects of 21st Century in mind which will facilitate the youth of Sri Lanka to evolve the learning process for meeting the demands of the 10 components of the knowledge society,” asserted Dr. Kalam. “Since I am in the midst of a business community, I would like to give the linkage between national economic development and creative leadership,” said Dr. Kalam. Dr. Kalam spoke about how economic development led to prosperity in a sequential manner. Nations Economic Development is powered by competitiveness. The competitiveness is powered by knowledge power. The revenue is powered by volume and repeat sales through customer loyalty. Customer loyalty is powered by quality and the value of products. Quality and the value of products are powered by employee productivity and innovation. Employee productivity is powered by employee loyalty, employee satisfaction and the working environment. The working environment is powered by management stewardship. For success in all missions we need creative leaders. Creative leadership means exercising the vision to change the traditional role from the commander to the coach, manager to mentor, from director to delegator and from one who demands respect to one who facilitates self-respect. The higher the proportion of creative leaders in an organisation, the higher the potential of success and the growth of organisation and thereby leading to accelerated national economic growth. “Dear friends, I have seen three dreams which have taken shape as vision, mission and realisation,” reminisced Dr. Kalam. Dr. Kalam went on to spell out the features of creative leaders. A leader must have a passion to transform vision into action. A leader must be able to travel into an unexplored path. A leader must have courage to take a decision. A leader should have nobility in management. A leader must work with integrity and succeed with integrity. Interestingly, we saw all the above in the late Dr. Kalam. “For a vibrant business, the important thrust will be on the generation of a number of creative leaders who will create, nurture and grow the business to its full potential by combating all the challenges faced in the process,” he went on to state. “My greetings and best wishes to all the participants’ success in the mission of creating new opportunities of growth through creative leadership,” Dr. Kalam concluded. “Dreams are not what you see when you sleep, they are the ones that keep you away from sleep.” We picked the above statement from Dr. Kalam as the thought of the week for PIM this week. It simply amplifies the purpose-driven life of Dr. Kalam. Perhaps a fitting tribute to him from Sri Lankan managers would be to diligently work towards not only organisational progress but societal wellbeing as well.